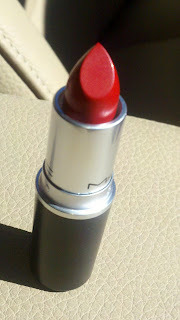 THE SKINNY: I am the Imelda Marcos of red lipsticks. You’d think that one color, in one milieu, would suffice. So not true. In my book, you can never be too rich, too thin or have red enough lips. It’s all part of my smoke and mirrors approach to beauty — enough red will draw the attention away from the bags under the eyes (which, along with stretch marks, unfortunately accompany raising two kids). I already had MAC Russian Red in the Lip Glass collection, but that’s too dressy (read “slutty”) for daytime and it has a tendency to migrate into those tiny lines around my lips. I’m totally willing to sport the feathery lipstick look when I’m 85, but with 50 years to go, I thought I needed to try another approach. I saw that MAC offers the same color in a lipstick and I had to give it a whirl. First of all, MAC lipsticks smell so good, you want to devour them like a huge chunk of chocolate lava cake. With ice cream. And hot fudge. I have not had this urge since the Lipsmackers debacle in 3rd grade. Having learned my lesson years ago, I merely donned the lipstick instead of ingesting it. The color is an incredible blue-red, which makes teeth look even whiter (and for the coffee and wine addict in me, is an added perk). The formula stays put, even after a few glasses (or maybe the bottle, but who’s counting) of vino. The only drawback is that the matte formula is difficult to apply. It drags on application. I thought that my primer was to blame, so in the name of research, I tried another application on bare lips. Same deal. It drags more than I do when I have to get up in the morning. Before coffee. No woman wants to tug at her face that much. Trust me. Lips have to be extremely well exfoliated too, because matte will show off any flaking or chapping. KEEP OR TOSS: Other than the tough application, the color is one of the most flattering reds I have EVER sported. If it was a crème formula, I would have given it my first ever 5-star rating. CHECK IT OUT: For the complete line of MAC lip goodies, visit their website. Bonus—free shipping on orders over $50!